As the biggest festivals of the summer took place this weekend, I thought it was about time I popped up a post about my go-to festival favourites. I might not be the biggest festival goer, but when it comes to festival beauty, I think I have it covered. Festivals are a mixed bag for beauty fans - on the one hand, you get to be creative and experiment with crazy makeup and braided hair styles, spray glitter everywhere and cover yourself in temporary tattoos... and on the other, you're stuck in the middle of a muddy field for days without access to water to wash your face, a decent mirror to apply your makeup or even a shower to keep yourself smelling nice. So, whilst we all know glitter eyeshadow and multiple packs of face wipes are essential, what else makes festival-going all the more fun/bearable? First up, of course, the necessary hair tools - aside from the obligatory floral headbands, my mini Wet Brush* is one of my must-haves. To be honest, I have this in my handbag all the time anyway but I think it's all the more important for taking to festivals - ideal for brushing out braids or backcombing hair even bigger and better. Plus, it'll definitely be needed once the festival is over and your hair is in need of a serious brush (and wash!) To keep my hair out of the way when things get a bit messy, my Invisibobble* is another thing I think is essential when at a festival. To be honest, I'm never without one of these little bobbles on me as they come in so handy. Festivals wouldn't be the same without covering yourself in temporary tattoos (I mean, I'd love to do this every day but festivals are the best excuse) and Glimmer's watercolour body art tattoos* are perfect for that boho festival vibe. Available in three different packs (I opted for 'Daydream') these hand-painted watercolour tattoos are absolutely beautiful to behold and look stunning on the skin. With a host of designs such as feathers, flowers, arrows, bows and words, there is guaranteed to be something for everyone, and I can see why it can be hard to choose just one or two to have on over a festival weekend! If nail art isn't your thing but you want to have cute festival-perfect ombre nails, these false nails by NAILHUR* are ideal. I love the stiletto shape of these nails and the baby blue, white and pink look beautiful together - amazing with a tan. The positives of wearing false nails to a festival are that they don't chip - but then you also run the risk of having them 'ping' off mid-dance! I'm a little bit accident-prone so plasters are high on my list of essentials for festivals (and general life, really!) There's nothing worse than a boring beige plaster, so these uh-mazing WWF plasters by Dermocare* will look after any scrapes as well as looking cool at the same time. They're available in packs of Safari and Ocean Life plasters, and each different size plaster comes with an image of an animal on it. I'm a bit obsessed with the lion and tiger ones! They even have some with penguins on - too cute! Of course, when at a festival is guaranteed you're going to sweat - a lot. Without carrying a can of deodorant around with you and spraying every five minutes, you'll need a very long-lasting, industrial-strength deodorant to keep you feeling dry and fresh. 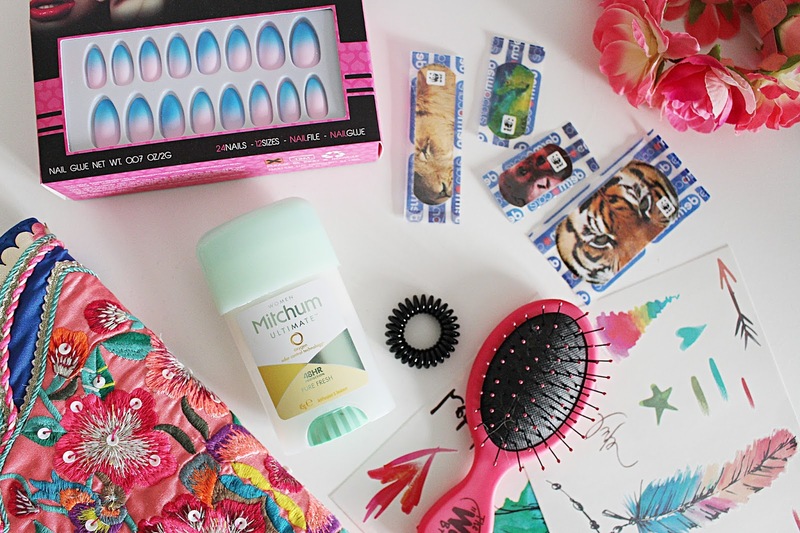 My current go-to for this is Mitchum's Ultimate 48hr Roll-On deodorant*, which smells amazing and really works at keeping sweat at bay, so you can enjoy dancing (or moshing) the night away without feeling gross. Have you been to any festivals this summer? Let me know how they were and what you packed as your festival faves - I'd love to hear!